to run their business. The study was carried out in Salem district, Tamil Nadu (India). fostering the growth of women entrepreneurs. engage in risky projects the more he/she gains profit. making the right decisions in mobilizing and utilizing the financial resources in their business. Do the women entrepreneurs have any plans to expand their business? Do the women entrepreneurs face any financial hurdles in their business? If yes, how did the women entrepreneurs manage the hurdle to run their business? deposited fund, selling fixed assets, borrowing from government. said that there is relationship between qualification and their opinions on business expansion. Do you face any financial hurdles in your business? age and their opinions on facing business hurdles. If yes, how did you manage the hurdle to run your business? have adequate knowledge/awareness on various banking schemes. Technology, 9(5), 2018, pp. 640–646. 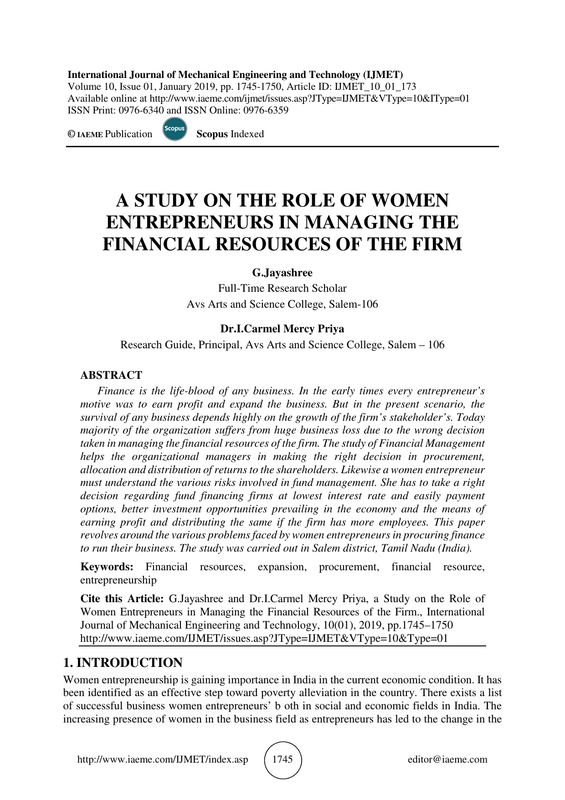 Advanced Research in Management, 6(3), 2015, pp. 100-108. Journal of Mechanical Engineering and Technology 9(1), 2018, pp. 266–275. Management, 7(1), 2016, pp. 123-131.